Miracle Extender is rated 3.0 out of 5 by 1. 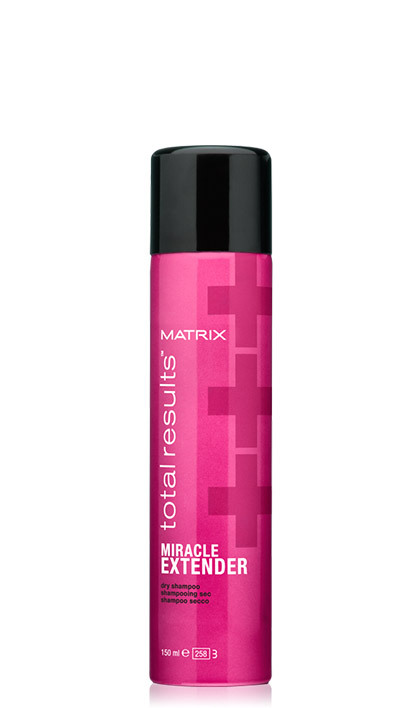 Share https://www.matrix.com/total-results/products/miracle/miracle-extender Miracle Extender Dry Shampoohttps://www.matrix.com/~/media/new media library/product listing/filter options/product types/haircare/totalresults_2015/miracle/total_results_miracle_extender_tr-m-me.jpg Refreshes hair and absorbs oil to revive your second-day look. Miracle Extender Dry Shampoo is your solution to reviving hairstyles when you do not have time to shower. Refresh your locks with the dry shampoo that absorbs excess oil, without flaking or leaving a powdery residue. Hold 8-10 inches form head. To condition and remold hair into place, spray in short bursts. Clean nozzle frequently to avoid clogging. If clogging occurs, run nozzle under hot water. Rated 3 out of 5 by JMac from Used to be my favorite First bottle of this I absolutely loved. Raved about how great it works. I've tried so many hair products was so happy to find one that worked so well. I only wash my hair once a week so I need a good product. Well the second bottle stopped spraying and still feels half full. I've run nozzle under water just about everyday hoping it comes back but only spraying air. Super disappointed.